Massive Varroa entry through robbery or collapsing large cell LC beeyards in the near and far. Investigations by Dr Christian Wurm about migration and infection of small cell SC hives by Varroa mites from foreign colonies in the vicinity of his beeyards. Dr Christian Wurm works for 10 years in Austria with small cell SC bees and carries 400 hives in biologically/organically certified operation method. 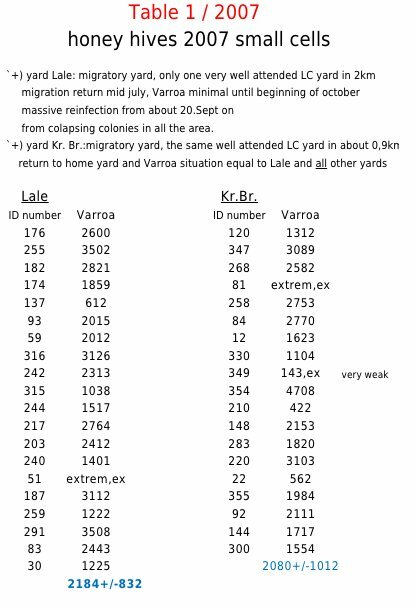 Basically, we can see that beekeeping with small cell SC hives works under the condition that the nearest large cell colonies are removed at least within 3 km (figure1, table1, table 1/2012). How this exactly takes place we cannot say, but that it takes place can be considered but almost certain. The beeyards Neuhof (NH 1 – 4) and Absdorf are situated near a river with relatively weak honey flow. Besides my hives there are no more bees there. So I liked to fill these yards with SC hives. 2009, a nearby located small sunflower field (about 0.75 hectares) was filled with 50 large cell LC hives by a migrant beekeeper. Visually these hives were in good conditions, even in varroa question they seamed to be without problems. But the sunflower did not bring nectar. Suddenly in the LC beeyard there was a great unrest and even a „biting“. After only 7 days the colleague went away quickly. 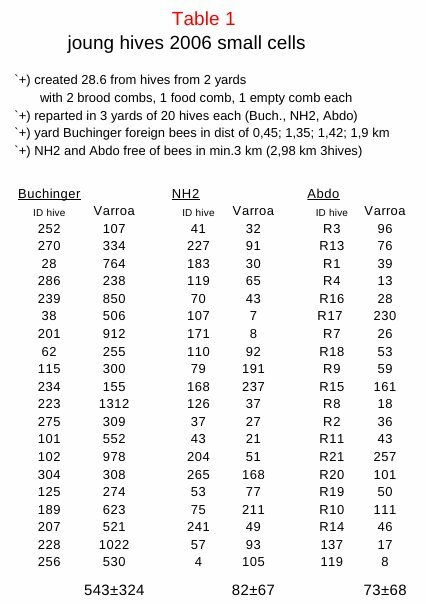 But what happend in these Neuhofer beeyards concerning Varroa mites is seen in Fig.1. It was made only one single OS treatment in winter. Only at the beeyard NH3 migration should no longer have taken place. 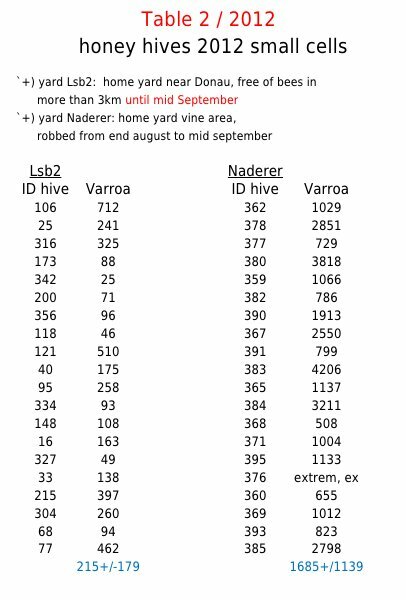 More clear evidence of migration of Varroa mites from LC to SC hives are recognized clearly in the Table.1 (young hives/2006) and Table.1/2012 (young hives 2012). As mentioned above, the Neuhofer Au is bee free, apart from my hives. In the period from the end of June / early July to mid-October, the number of mites has increased 2006 sevenfold in the Buchinger hives against the comparing hives and 2012 sixfold! Therefore: smallcell SC hives should always be at least 3 km apart from large cell LC hives! The beeyard LSB2 is / was my most remote yard, where I performed my „survival tests“. Since mid-September 2012, a beekeeper has introduced at about 1,5km his LC hives. Therefore I have performed this year in winter an OS treatment. Whether the isolated higher varroa numbers are due to migration (mid-Sept to mid-Oct) or on internal „Varroa propagation mechanisms,“ I cannot say. The beeyard Naderer is located in the wine district and until this year there were no problems concerning Varroa. But this year, my hives robbed in late summer, sometimes more, sometimes less. The deprived LC hives were about 1 km away. The here shown Varroa falls are solely produced through one OS-treatment in winter. The one time treatment with AS at the end of August was defined as „fire brigade“ of survival. After this I have not counted due to time constraints, however the Varroa deposits were „brown“. b.) The second cause of massive Varroa entry is if the SC hives are encircled by collapsing LC hives. See Table.1/2007. Here I have no comparison yards any more, because all beeyards were severely affected. Despite previous excellent fir flow, the hives were after preparation work for winter (late August / early September) in a dreamlike state – 2 boxes Zander full of bees and approximately 55 – 60% were still in the high bottom board! 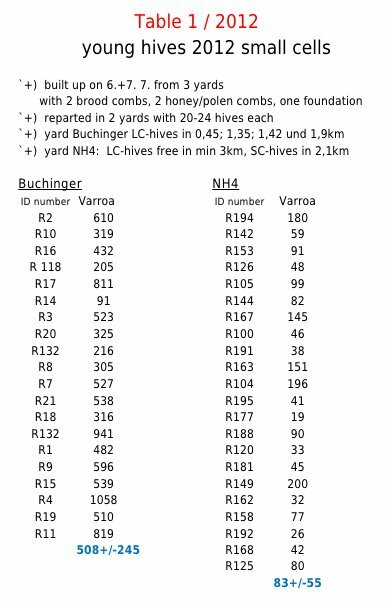 Varroa was minimal, approximately every 15th to 20th drone cell had a Varroa. There were no multiple occupations. From around 20th September a „Varroa tsunami“ swapped over all hives, as I never experienced until then and never ever since then. In October two AS-treatments were carried out as a last resort. The Varroa boards were brown after each treatment! Naturally I was not able to count anymore. The varroa numbers of the two sample beeyards reflect only the remaining mites after one OS winter treatment. I can well imagine that the entire Varroa burden ranged between 6000 und 10000 Varroa mites. (AS and OS-treatment together) This is despite that massive Varroa entry started not before aprox. mid September! Due to the very large work assignments in late autumn and early winter, I was able to keep the total losses at relatively low 8% , but the strength of nearly of all hives coming out of winter 2008 was very low. 4-6 combs of bees – but they were alive! Apart from my hives and these of a colleague, about 85% of the hives of the local beekeeping asociationTulln were dead. Cause: Almost all, especially the older beekeepers, followed a cheater. There were „miraculous stickers“ (Pickerl) offered against Varroa and used. On all 4 sides of the hive, on the top and bottom outside had to be a sticker glued. By the „energy“ that supposedly emanated from these stickers, the varroa should be expelled. When I still had LC hives (5.1), I did not notice such a tragedy of migration, especially of massive Varroa entry in late summer / autumn, in this extreme form. Only since I work with samll cell SC hives and especially since 2006, I was fully aware of this fact. 1). from about 2004/2005 Apistan has turned ineffective in conventional beekeepers (resistance) and therefore was stopped. All beekeepers – regardless of the level of education and age – had to cope with AS, OS and thymol products. And many of them were overwhelmed! 2. Small cell SC hives seem much more compact and robust than large cell LC hives. Probably LC-bees feel that and try more to be propagated in the SC hives. Regardless of whether they are accepted or not, a possibly brought varroa would be already in the SC hive. Whether this is so, would have to be clarified by scientific experiments. Considering our central european conditions regarding bee density, we have to succeed to convince our colleagues that surround us about the advantages of small cell hives. So we can dominate larger areas with our small cell colonies and we can select easier for survival rates! That beekeeping with small cell SC hives will work, you have to keep a distance of at least 3km to large cell LC hives. With massive varroa entry, as in my case in 2007, also SC hives have be treated, otherwise they have no chance of surviving! The 3km distance in 2007 was too little either !